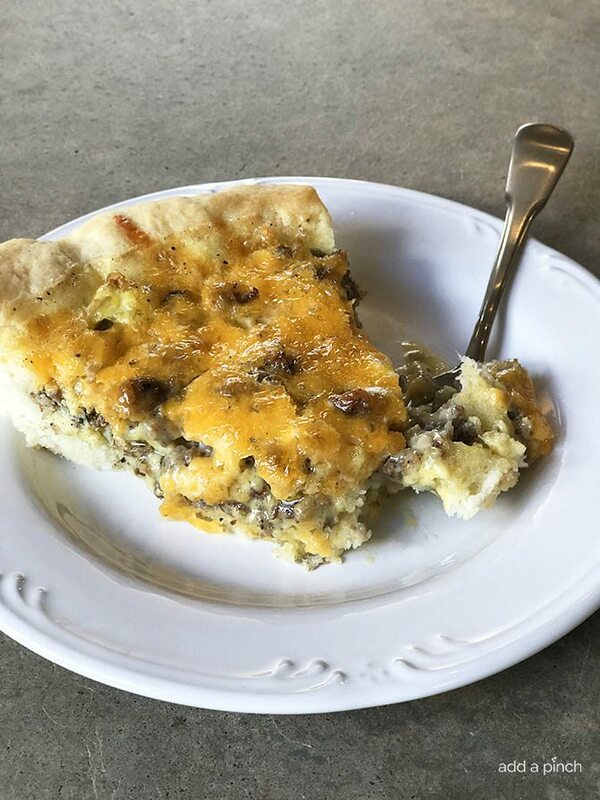 This Southern Sausage Cheddar Quiche recipe makes a quick and easy breakfast recipe. 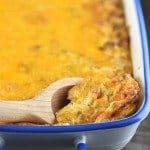 Ready and on the table in 30 minutes, it is a Southern update to a classic! Like everyone else I know, mornings are always busy around our house – even on the weekends! 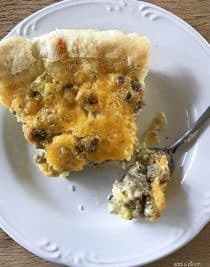 That’s when I turn to recipes like this Southern Sausage Cheddar Quiche recipe! 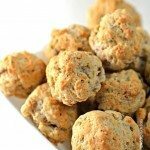 Made with a simple cream biscuit crust, it is out of this world delicious and a definite family favorite! To make it, I begin with my two ingredient cream biscuit recipe as the crust. 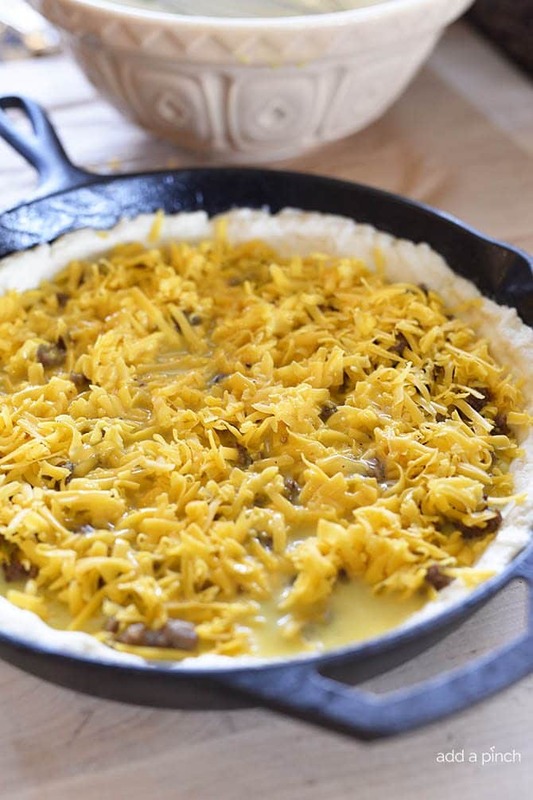 You can’t get much simpler than two ingredients for a delicious crust like this one! 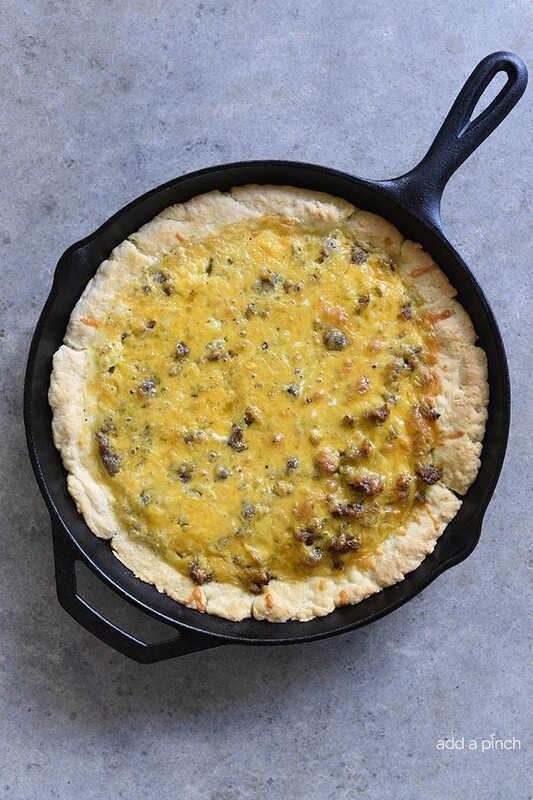 Once you have your dough mixed together, you press the dough into the bottom of a medium skillet and up the sides of the skillet about two inches. Next, I brown my sausage and add to the biscuit dough. Then, top with the grated cheddar cheese. And then you’ll whisk together the eggs, milk, salt and pepper and pour over the sausage and cheddar. And then pop it into the oven to bake until the eggs have set and cooked through, about 20 minutes. Remove from the oven and let rest for a minute or so before slicing. I know, it sure is hard to wait! 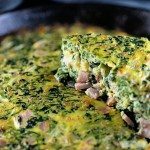 Since this quiche is a meal in itself, it really doesn’t require a whole lot to serve with it. 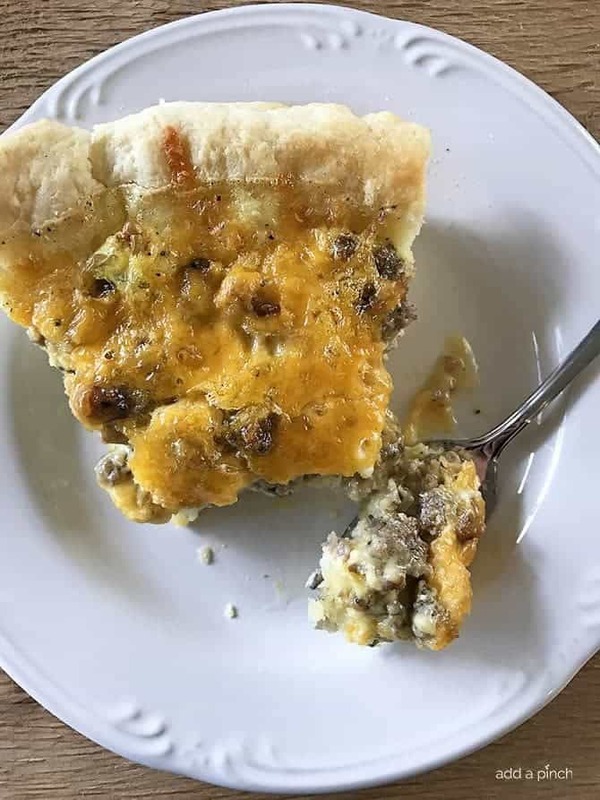 Here’s my Southern Sausage Cheddar Quiche Recipe. I hope you enjoy it! Preheat oven to 400ºF. 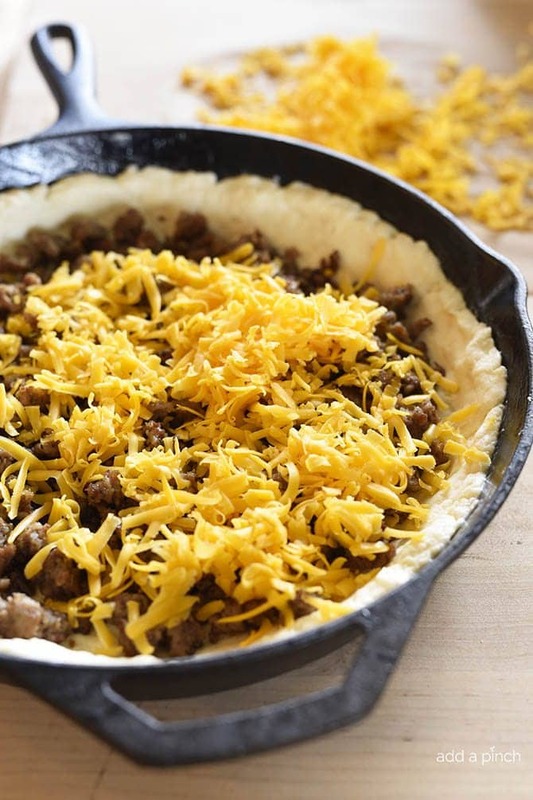 Spread softened butter along in the inside of a medium (12-inch) skillet. Set aside. Stir together self-rising flour and heavy cream in a medium mixing bowl until just combined. Press the dough into the bottom of the skillet and about 2-inches up the sides of the skillet. Set aside. In another medium skillet set over medium heat, crumble and brown the ground breakfast sausage, about 5 minutes. Remove from the heat. 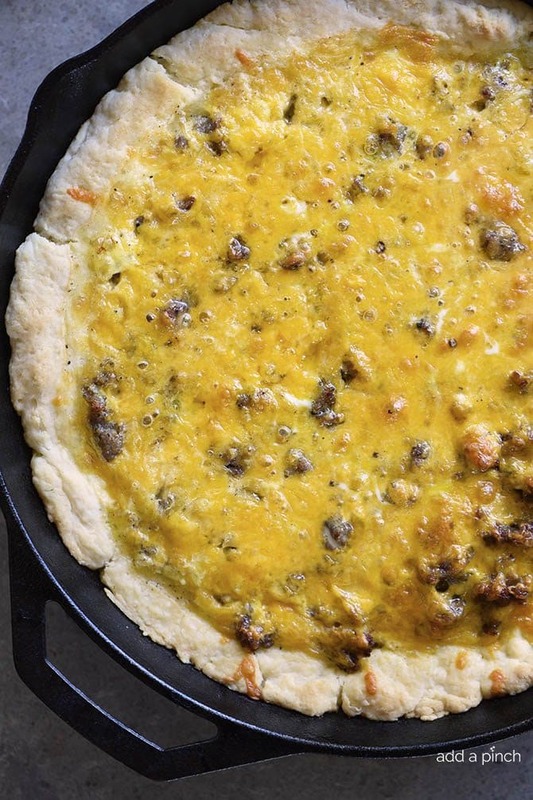 Using a slotted spoon, remove the browned sausage from the skillet and sprinkle onto the biscuit dough.Top the sausage with the cheddar cheese. 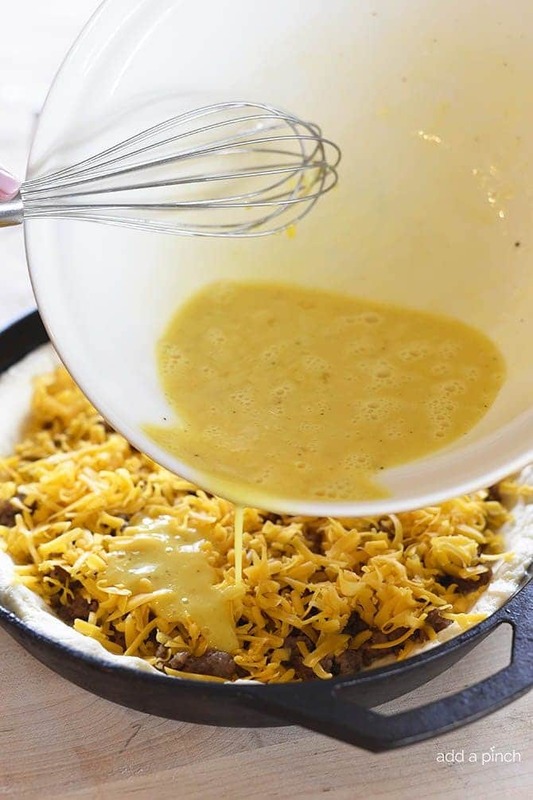 Whisk together the eggs, milk, salt and pepper and pour the mixture over the cheese. 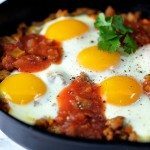 Place the skillet into the oven and bake until the eggs are set the breakfast pizza is golden brown on top, about 20 minutes. This looks good.. I could handle this for an evening meal when want all done quickly as going out or been out.. thank you..
Robyn, I made this last night. I added a touch of onion and it was delicious! Since we are empty nesters, we have plenty left over for Saturday morning brunch. 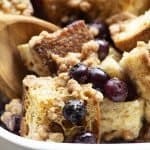 Thanks for sharing another great recipe! Curious if this could be made the night before. Looks wonderful! I’m wondering if this work in a glass pie plate since I don’t have an iron skillet. What do you think? It should be fine as long as your glass dish is oven safe. I hope you enjoy the quiche – it’s delicious! Thanks! Anything with cheddar sparks my attention, and I must say I never tried any quiche recipe this delicious before. This tastes heavenly! Thank you for sharing the recipe! This breakfast reminds me of childhood. My grandma is from Alabama and my favorite breakfast she made was biscuits and gravy. The combo of biscuits and sausage will always remind me of her. 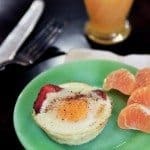 I love your take on classic breakfast food. My kids would love it ? Memories of our grandmothers’ food always has a special place, don’t they? I’m happy you are giving this a try. Thanks so much! Can I use GF all purpose flour? 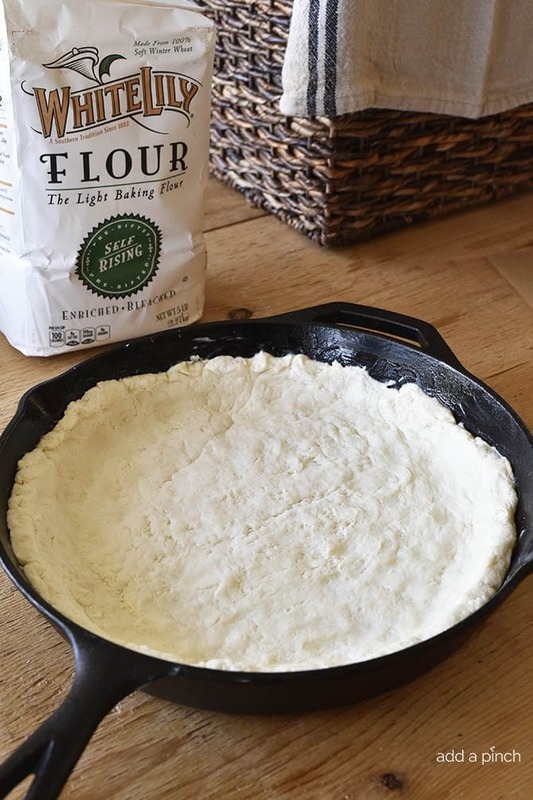 For this recipe, you will need self-rising flour if you make the two-ingredient biscuit recipe for the crust. If you don’t have gluten free self-rinsing flour, you can make it using my recipe for Homemade Self-Rising Flour. Be sure to add a gluten free baking powder to your gluten free all-purpose flour to make it, though. Hope you this helps! Do you think I could use half and half in the crust instead of heavy cream? This looks delish. There would not be enough fat for the crust if you used half and half.